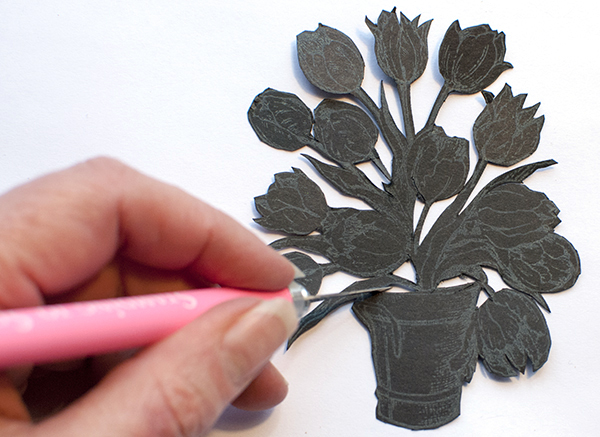 My inspiration is traditional paper cutting or “Scherenschnitte“. My husband and I have a large really incredibly detailed framed paper cutting over our fireplace. It is one of those things that has been there so long that you stop really seeing it. But last weekend, we had some family over and they were asking about the paper cutting. Then a couple of days later, I happened on a Ted talk about “Beatrice Coron: Stories Cut From Paper”. Wow! Amazing, amazing stuff! So I was looking at my stamps today with the earlier conversation and the Ted talk in the back of my mind and I starting wondering if I could use my stamps to create a paper cutting. Now, if you know me, you know that I am not a careful or a patient cutter. 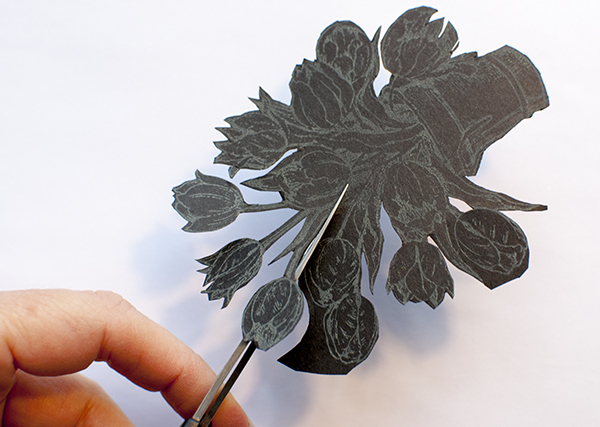 “Fussy cutting” as some people call it, isn’t really my thing. But I decided to try it anyway. If you are not patient, try doing it while listening to a TV show or the radio. Then I used small sharp scissors to cut out the image. I used a sharp craft knife to cut out the internal details. Then I starting flipping the image over to see how it looked. I found that where some of the image details clumped up near each other, I needed to cut away a little more so that each flower and leaf looked more distinct. I hope that you will take a look at your stamps with not only an eye to their detail, but also to their outline shape. Not all stamps will work this way. And keep in mind that because you are flipping the image over in the end, the image will be reversed. But do play around with it and see what you come up with! 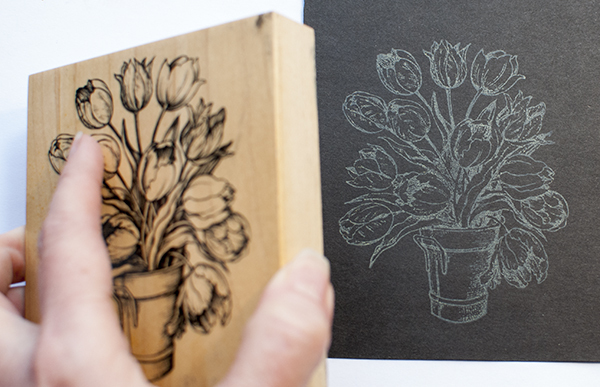 I used to be willing to do this, now I just put the image into my digital cutter and press the button! I used to do lot of scherenschnitte, but haven’t done any lately. Will have to try some of my stamps to make patterns. What a lovely look – it a lot of work!!!! Just got a Silhouette cameo….now to figure out how to do this with that! A little of this and that is always good – LOL! Do you happen to know how to convert a photo into line-art so it can be printed in The line art form? Thanks Nancie….I will watch for it! Thanks for the tutorial on how to do this. I have wondered before how to and all I could come up with is to color it all in. But that always had a messy look to it. Now I know how to do it!! Thank you!